TOMO TOLKKI stated his musical career in 1984, when he joined STRATOVARIUS. He has been lavishly awarded and been a most active part in selling 2.5 million albums. In 2007 he dissolved the band, and later on gave away the rights to the name in disappointment when his former band mates soldiered on without him. 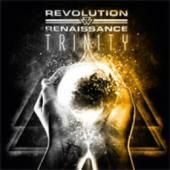 His next move was REVOLUTION RENAISSANCE, and the first installment, aptly called “New Era”. He picked his musicians via MySpace; Gus Monsanto, vocals, Bruno Agra, drums, Mike Khalilov, keyboards, and Justin Biggs, bass. 2009 saw the second opus, “Age of Aquarius”, but there was also a lot of commotion concerning the band´s recording contract. Prior to this album they presented two new members; Magnus Rosén (ex. HAMMERFALL, ex. FULLFORCE) on bass and Greek keyboard player Bob Katsionis (FIREWIND). Timo claims he´s now returning to his roots and what he does best. REVOLUTION RENAISSANCE opens with a guitar explosion and an ok track. But ok just doesn´t cut it on this CD. Gus voice sounds oddly strained sometimes in faster songs, but in the bombastic title track and the power ballad “Frozen Winter Heart”, he works wonders. Timo and Magnus are dazzling on the album, not least in “Trinity”. But there are a number of mega songs on offer; “Falling to Rise”, “A Lot Like Me” and “Dreamchild” all have melody and the fire. It strikes me that the vibes are somewhat similar to that of RAINBOW in the early days at times. I was quite disappointed with “New Era”, but this is a magnificent offering that puts REVOLUTION RENAISSENCE up for top 10 2010!